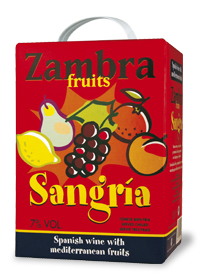 Refreshing drink produced with red wine and natural citric fruits made of concentrated juice, natural spices extract and sugar. The base for this drink is a young red wine with medium color intensity and pleasant fruity aromas. Fruits concentrates are carefully chosen. As a result of this process, we obtain a fresh, refreshing and sweet drink, ready to drink at any time. Grilled food, snacks, paellas, pasta, salads o by itself.